Tomorrow’s the event of the year! As always, the star of the show is the food and wine on offer. This year over 300 wines from all over the world will be available from wineries including Herzog, Yatir, Castel, Capcanes, Elvi, Goose Bay and more! In addition, Royal Wine will be launching some new wines at KFWE2011 including the Herzog Special Edition Chalk Hill Warnecke Vineyard 2008, the Oak Knoll Single Vineyard Cabernet Sauvignon and a new line of Gamla Reserves. Additionally, the wines of Alexander Winery in Israel will be making their debut in the United States market. Guests will also be able to taste delicious food from some of the top rated kosher restaurants and caterers in the Tri-State area. “This is an opportunity to try some exceptional wines and great food, we don’t hold anything back,” said Mr. Landsman, “KFWE is our gift to our customers. We want to give people a chance to try the wines they are hesitant to buy, the special occasion wines they read about or see in the store.” Another benefit of this event is its proximity to Passover, giving people the opportunity to trywines that they would like to feature at their Seders. A notable addition to the event this year will be the attendance of celebrity cookbook authors/food personalities Joan Nathan, Jamie Geller, Suzy Fishbein, Lévana Kirschenbaum and Jeff Nathan who will all be available to discuss food and wine pairing and their newest books. 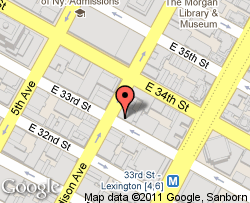 KFWE 2011 will take place on Tuesday, February 22, 2011 at 6:30pm at Pier 60 – Chelsea Piers, NYC. For more information on the 2011 Kosher Food & Wine Experience or to order tickets, please visit: http://www.kfwe2011.com . Don’t forget to enter KSCENE10, as your discount code, when you buy your ticket(s). Barkan, with vineyards all across Israel, is the second largest winery in the country. The winemaking team’s quest to produce a variety of quality wines results in Barkan making all of the right moves (including large financial investments) to continue improvements in their vineyards and in the winery. You can always count on Barkan, and it’s Boutique winery Segal, to release quite a few interesting wines. All wines and foods, during the tasting, are Kosher. Israel Wine Lovers meets at the back of Nanoosh and brings their own food, their own wines, since Nanoosh is not under ANY kosher supervision!!! This past Wednesday, October 28th, I attended a wine tasting by the Israel Wine Lovers Group in Manhattan – at the end of two days at Kosherfest. The wines featured, this particular evening, were from Israel’s Ella Valley Vineyards, distributed here by Monsieur Touton Selection Ltd. The wines were presented by Joseph Berkowitz (from Monsieur Touton Selection Ltd.). We tasted 7 different potables. We started with a Sauvignon Blanc 2008, pale straw colored, its aroma spoke of lime, pears with a hint of minerals. It tasted very citrusy, definitely showed promise. 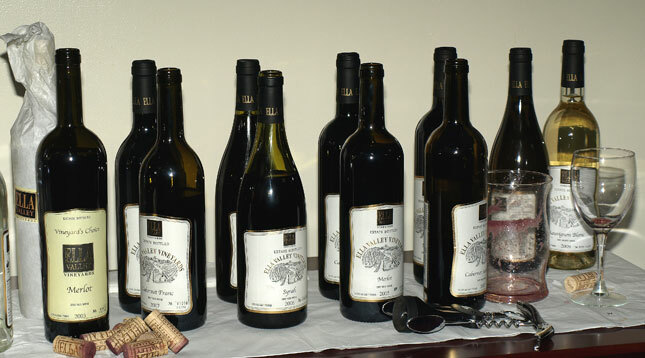 Ella Valley Winery‘s Chardonnay 2007 followed. This wine is aged for 11 months in French oak barrels. On the nose one detects pineapple and apricot, with a small amount of minerals. We tasted the first bottle at room temperature and it fell a bit short of perfection. But, that was just the first bottle… Please read on until the end, gentle reader. Next we had their Cabernet Sauvignon 2005. With 95% Cabernet Sauvignon and 5% Merlot, this wine was aged in French oak barrels for 16 months. Its aroma shows some unique minerals and plums, with a hint of the French oak’s vanilla. It tasted far superior to the two previous selections, with a beautiful ruby red color and refined complexity that gave it depth and character. We segued the above with the winery’s Merlot 2005. Aged for 16 months, it is bended from 95% Merlot and 5% Cabernet Sauvignon. On the nose one finds it ripe with red fruits and some seasoning herbs. On the palate the fruitiness becomes mixed with bitter chocolate and a hint of coffee. Very good! We then moved to the Cabernet Franc 2007, with 90% Cabernet Franc, 5% Cabernet Sauvignon and 5% Merlot. its aroma bespeaks of pepper, blackcurrant, with a hint of tobacco and violets. Though it is usually quite lighter than Cabernet Sauvignon, this particular selection had a dark red color. It opened to a distinctive peppery start but yielded to cherry, licorice and citrus peel on the long finish. We went on tho the Ella Valley Vineyards‘ Choice Merlot 2003. Aged for 17 months, it consists of 100% Merlot grapes. Powerful and gripping, royal purple in color, its aroma has strong notes of black cherry, berries and spices. In the glass it shows a full body and firm structure. Its elegance is obvious! It ends with an appealing spicy oak on the long finish. After such a powerful wine, Mr. Berkowitz suggested we end the evening with a well chilled bottle of Chardonnay 2007. Unlike the first bottle we tasted (at room temperature), this one was full of flavor and deliciously refreshing. It compared more than favorably with other Israeli and Chilean Chardonnays I tasted at Kosherfest earlier in the day. This time it showed the true reason Daniel Rogov awarded it a rating of 90. Where: Quint, Miller & Co. The beautiful Ella Valley, the site of the first TKO (David vs. Goliath) is now the home of a young and efficient winery nested among quality vineyards. The French trained winemaker Doron Rav Han continues the ancient wine making tradition in the Valley — biblical wine making facility was discovered near the winery recently — and produces some of Israel’s better wines. Sit back, relax and join other wine lovers at the Israeli Wine of the Month Club’s interactive wine tasting experience. * Several wonderful Israeli wines will be explored. Cheese, crackers and fruit also served. * You will be encouraged to voice your opinion about each wine and write elaborate notes — be Robert Parker, Tom Stevenson or Daniel Rogov for a night… Every opinion counts ! I’ve been to some of these tastings and I always found (here, here, here and here) the wine selection superlative; the cheeses and fruits specially chosen by Chef Eran Elhalal have invariably been a perfect complement to the potables. I’ll be there, gentle reader, will you? Just come over and say hello! When you sign up, why not let them know that you first saw it on this blog? Today, Brunch with Rabbi Yaakov Spivak. Starts at 12:00pm sharp. Come to Learn and get a 50% discount on your meal! Dinner and a Show with the incomparable Levana. Mention you saw it on The Kosher Scene and get a discount on your ticket. Featuring wines from the Tabor Winery. Check the links above and don’t forget to mention you first saw it at The Kosher Scene. I’ll be at all four events, hope to meet you there! More than once, have I listened to my friends complain about a failed attempt at braising short ribs or Lamb Shanks and worst of all, after spending hours preparing,ended up with a dry/stringy/pale/tough piece of meat and finding all that right before the guests arrive. So, from today onwards, those tales of woe, the agony will end. Braising is a wonderful way of utilizing the less expensive tougher cuts of meat that usually are not fit for dry cooking methods like brisket, and chuck or cuts that would require a long slow roast like leg of Lamb,lamb shanks and Beef Short ribs . Moreover a braise can be made ahead of time in large quantities , making it a great solution for a big family. In fact, a braise is great the day it’s made, but it is FANTASTIC the next couple of days. What we sometimes call tough cuts of meat are actually tougher due to the fact that they come from high mobility muscles. To give a simple example – cows stand and graze most of the day, hence their legs, chest and neck muscles are very strong. Strong=Tough! 2 1/2 Lbs short ribs /3-4 Lbs if on the bone. Have your butcher cut the meat to 3-4 incl long pieces,1 1/2 -2 inches wide. 1 Lb small red potatoes.If you find large ones,quarter them lengthwise. 2. Pat the meat dry, season well then dredge in flour. Heat a cast iron skillet or large heavy stew pot. Add 2 Tbsp oil and sear well on all sides. Remove and set aside. 3. In the same skillet brown the vegetables and remove. 4. Drain excess fat carefully place the vegetables in the hot Pyrex pan,add tomato paste and mix well with a wooden spoon .We want to coat the vegetables evenly and brown. 5. Deglaze with wine, then add cider, molasses herbs and spices. Leave 6-8 minutes in the oven so the liquid starts to reduce. 6. Add the meat , taste , adjust seasoning then cover tightly and place in oven. 7. Lower the heat to 275F and braise for approx 5 hours. Check to see meat is very tender. Alternatively you can set the oven to 150F-160F and braise overnight. 8. Cool well in the pan. the best way is to make an ice-water bath in a clean sink or larger pan. Then, lift away excess fat. 9. Remove meat potatoes and carrots gently,discrad of the rest . Portion the meat when cold. ( This is important ! ) Reheat the cooking liquid and strain well through a fine sieve. 10. Reduce the liquid until a smooth and thick sauce consistency is achieved. Add the meat and vegetables. Simmer gently in the clear shiny sauce. Château Pontet-Canet Paulliac 2002. A solid wine with berry, currant and mineral character. Full-bodied, with silky tannins and a long finish. Racy. On March 31 2005 the Wine Spectator awarded it 92 points, as one of the top French wines of its vintage year. We enjoyed the Tabor tasting, that took place a few months ago, so much that we asked Tal to come back and present new and exciting Tabor wines as well as educate us further regarding the influence of soil on the grapes….. Sit back and relax; join with other wine lovers at the Israeli Wine of the Month Club’s interactive wine tasting experience. * Nine wonderful Israeli wines will be explored. Cheese, crackers and fruit also served. 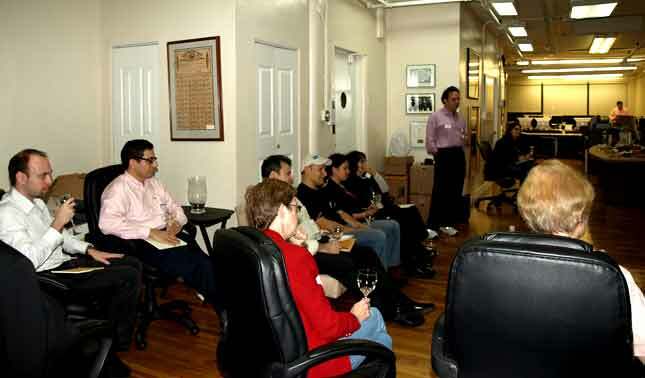 This past Wednesday evening, Avi Ashman’s Israeli Wine Lovers Club held a tasting with the theme “How Sweet it ISrael”. We tasted and discussed 6 selections. Jay Buchsbaum sharing his encyclopedic knowledge of wines in all their nuances. The tasting started with Carmel Moscato di Carmel 2009, a very nice fruity light wine. It’s sweet with hints of peach and citrus. It is meant to be consumed within the first 2 years of production as it doesn’t age well. Next we had a Carmel Vineyards Selected EmeralRiesling and Chenin Blanc 2009. Drier than the first, most of us agreed that it would have more fair to this bottle had we tasted it before the Moscato. Even so it exhibited some interesting qualities. I would not have classed it among dessert wines, however. We then tasted a Gamla White Riesling 2007 from the Golan Heights Winery. It tasted better than the previous one, exhibited some floral notes and tropical fruits. It can be enjoyed as an aperitif, would likely do very well in conjunction with spicy food. 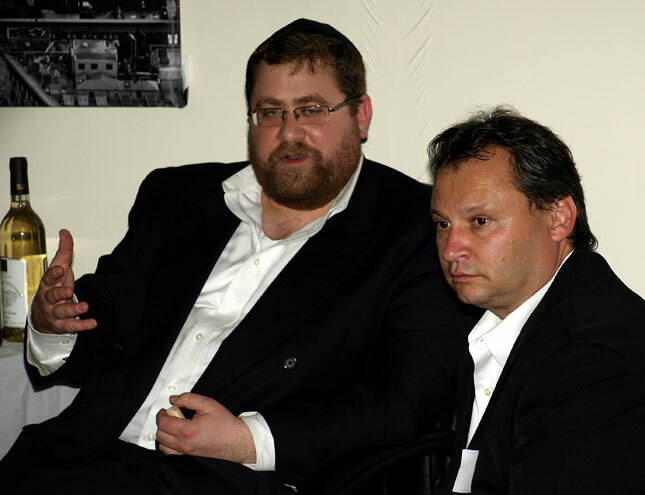 Then we turned our attention to Zion Dolev Muscat Hamburg 2009. Made from Musct Hamburg grapes grown in Galilee, it was was pleasantly sweet and silky. A very nice dessert wine, a perfect complement to any pastry. Carmel Sha’al Gewurztaminer 2006, very flavorful it evoked some exotic fruits bringing to mind the Chinese litchee among others. 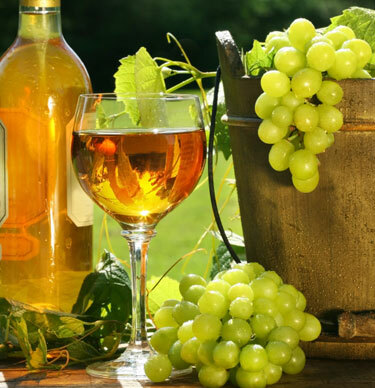 Produced from gewurtztraminer grape grown in the Sha’al Vineyards, this wine has a lively flower aroma. Sweet with just the right touch of tartness. This wine will taste better as it’s allowed to age. The last selection was a very unusual wine, Zion Dolev Cabernet Sauvignon Semi-Sweet 2009. Cabernet Sauvignon, is the prime grape used for dry wines. None of us expected the subtle sweetness of this bottle. A superb wine that would go well with more than just a sweet dessert. As usual Eran Elhalal, the group’ resident chef, prepared a great selection of cheeses, grapes, and walnuts. This time he also added some very nice desserts to help us pair the wines. Not only were they delicious but they made the wines taste better!